The Bosch High Performance LED monitors are 1080p Full HD resolution color monitors ideal for use with analog video, digital video recorders (DVRs), and with PC applications. 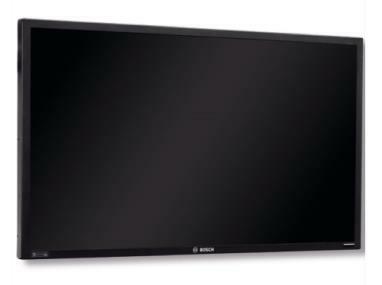 The monitors feature a color LCD flatscreen panel and are available with 42-inch or 55-inch viewable picture areas. Each monitor features a wide range of horizontal and vertical viewing angles that provide comfortable, clear viewing – whether you mount it to a wall or to a ceiling. Viewable Picture Area 42 in. , 55 in.